Last week, I had a "girls' night out" with Linda and Jess over at Il Buco Alimentari & Vineria (Il Buco AV), the " rusticated market-restaurant spin­off" of Il Buco on Great Jones Street in NoHo. 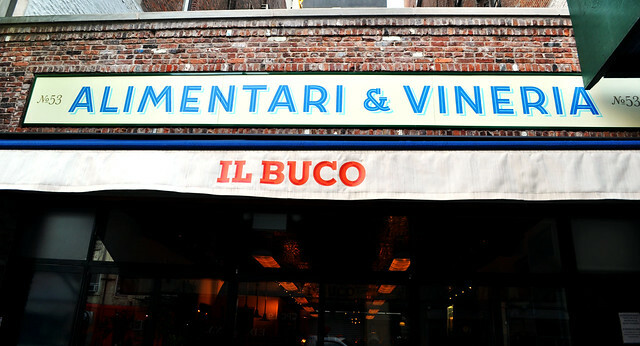 While Il Buco is formally a restaurant, donned with white tablecloth and all, Il Buco AV is part market/grocery store (the alimentari part of the name) and part wine bar (the vineria part of the name -- though there's a little more kitchen to it than a typical wine bar). Communal tables occupy the main open spaces in the shop, integrated right into it, similarly to how Eataly is set up, only in a more intimate, seemingly more authentic space. We sat at the table situated closest to the entrance, in front of the wooden spice shelves, sharing it with another dinner party. 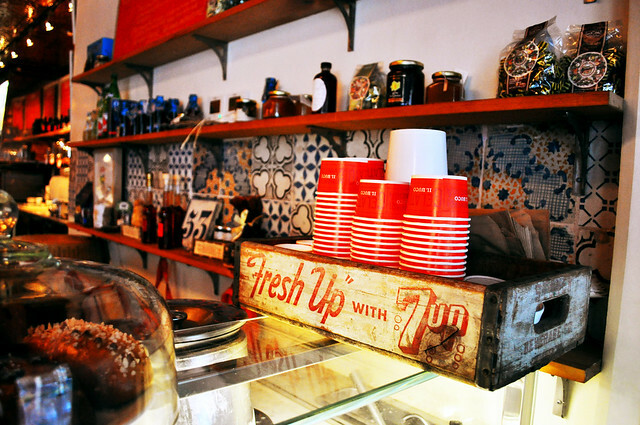 View of the little rustic knacks at the gelato counter. Once seated, we were given the Vineria's menu. Thinking it'd be easy to make a decision, given its one-sided menu displayed against a petite wooden plank, we had quite a challenging time narrowing it down. Another case of choice paralysis strikes again -- we were tempted to just give up and ORDER ALL THE THINGS. Fortunately we still had an ounce of self-control left to focus on the matter at hand. Our server also helped us pick out a bottle to share that evening. He suggested the "Vigo" red wine blend from appellation of Etna in Sicily produced by Romeo del Castello with a 2008 vintage. It had a lovely scent, and even more delicious taste. It was the perfect bottle to go with the myriad of things we had in store for us that evening. 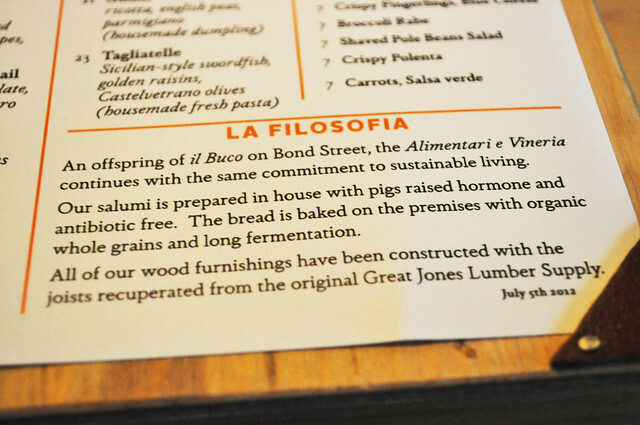 The philosophy of Il Buco AV, the same as its parent restaurant, Il Buco, is remaining committed to sustainable living. As it reads above, all of the wood furnishings have been constructed with the joists recovered from the original Great Jones Lumber Supply. 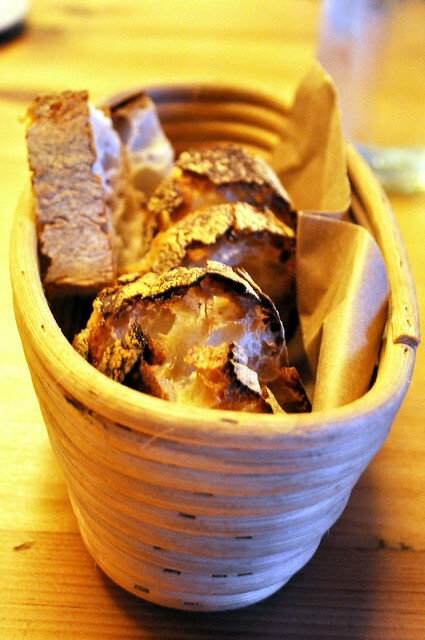 The bread is baked fresh on site with organic whole grains and long fermentation (a rise that lasts at least for 18 hours) by in-house bread baker, Kamel Saci. A quick thanks to Pete Wells, the incumbent New York Times restaurant critic, for all of this awesome background I am about to share. 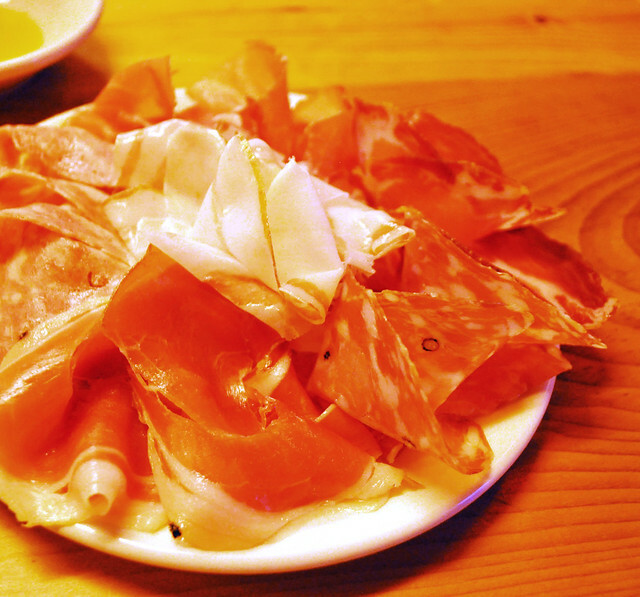 Now what gives the restaurant major bragging rights are its cured meats (salumi in Italian). The salumi is prepared in-house with pigs raised hormone- and antibiotic-free from reputable farms, including Flying Pigs Farm in upstate New York, North Carolina's Cane Creek Farm, and Bev Eggleston's EcoFriendly Foods in Virginia. The meats are cured and aged in the basement of Il Buco AV, among the finest salumi made in the country, quality nearly replicates the ones found in its home country of Italy. Donna Lennard, one of the restaurant's partners, "entered the cured-meats business about a decade ago at her first restaurant, Il Buco," and at the time, "only a few people in the United States were trying to replicate Italian-style salumi," discovering that even fewer Americans were "raising the old breeds of hogs whose thick sheath of sweet, creamy fat is essential to great salumi." Even with the proper knowledge and skills, the city's health department could end the authenticity of technique right there. In Ms. Lennard's experience back in 2006, "the city's health department told her that the temperatures in Il Buco's basement curing facility were all wrong," making the restaurant chop all of the prosciutto (some two years old) into little pieces, pour bleach over it, and place them into plastic bags to throw into the garbage. To counter the catastrophe from never occurring again, Bernardo Flores, the in-house butcher, now has "high-tech curing equipment in the basement of the new restaurant imported from Italy at some expense." To also "keep the inspectors at bay, she hired Christopher Lee, a longtime salumi maker at Chez Panisse." Now given Il Buco AV's reputation with curing some amazing meats, we pretty much had to order the salumi della casa selezione per due (selection for two), which included a wide assortment of lonza, capocollo, finocchiona, salame Toscano, guanciale, prosciutto, pancetta, lardo, and perhaps some others, thinly sliced in neat, satin piles. Having never been to Italy, I can safely say that I've never had any salumi that tasted this amazing. Thin as paper with texture as soft as silky ribbon, each slice melted right onto the warmth of our palates. That inherent stringiness encountered frequently with domestically cured meats like prosciutto was nowhere to be tangled -- just straight up quality salumi. I seriously could go back just for wine and to snack on this. It wasn't even super salt where you'd need a starchy medium like crostini/bread/crackers with which to enjoy it. The prosciutto and the pancetta/lardo were probably my favorites. 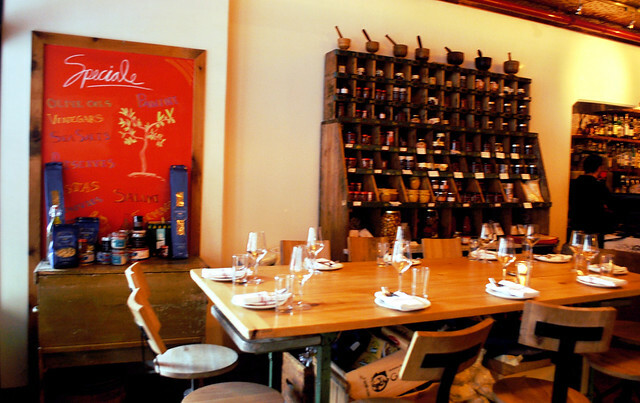 Chef Justin Smillie heads the kitchen at Il Buco AV. Prior to his current post, Chef Smillie has had the pleasure of working at other famed New York City kitchens, including the ones at the Mercer Kitchen, Gramercy Tavern, Barbuto (with Chef Jonathan Waxman), The Standard (with Chef Dan Silverman), and The Harrison (with Chef Jimmy Bradley). Since then, he has garnered a reputation of being fastidious with ingredient quality, especially as he was the chef who was fired from an East Village gastropub (i.e., the now shuttered E.U.) for overspending at the Union Square Greenmarket (crazy, huh?!). Just from that, you can probably gather that Il Buco AV is about the best ingredients with pretty literal farm-to-table appraoch and making it work. During the East Coast's produce downtime in the winter months, Il Buco AV sources its produce as best as it can from California. 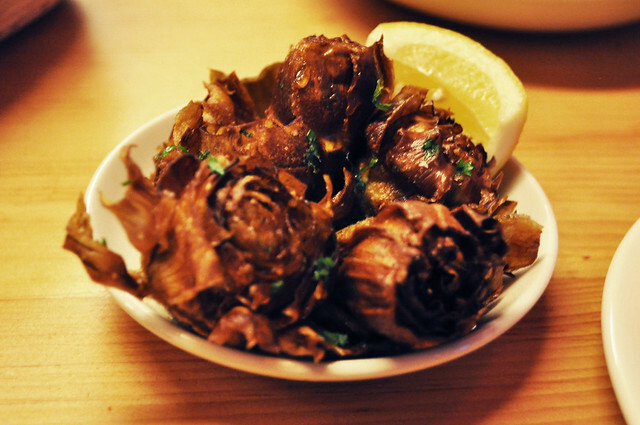 So our meal began soon enough, first with a few appetizers, including the crispy artichokes with preserved lemon and parsley. They certainly had a flash-fried quality to them, and a little squeeze of lemon went a long way. Great to nibble on while waiting for other courses! 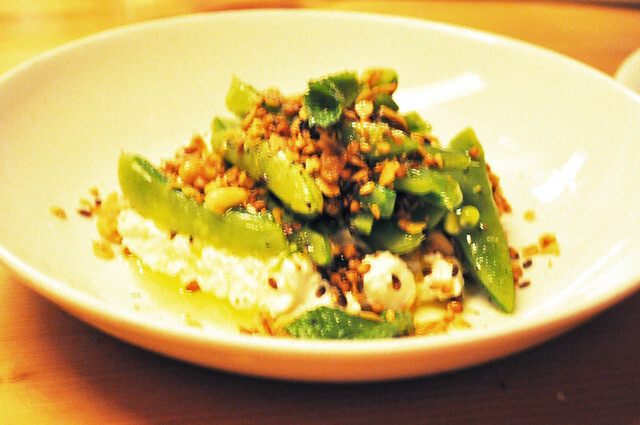 We also had the ricotta with sugarsnap peas, pine nut granola, and mint. This was a very spring-summer inspired dish, given the ingredients used and temperature overall. Chilled and snappy, the sugarsnap peas swept up the creamy ricotta while the crunchy pine nut granola clung onto the white wisps of whey, resulting in crisp bites of green, earth, and cloud. However, my only gripe (completely a personal one, at that) was how this dish was served chilled. I typically like my ricotta warm, so it was quite the surprise to me to find it served almost like yogurt's consistency and temperature. 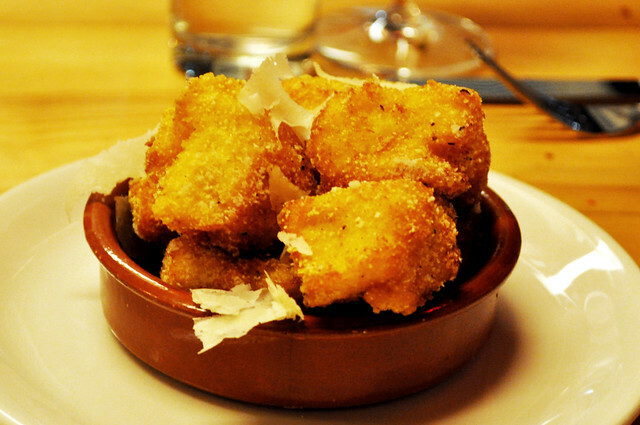 Perhaps I'm not used to this preparation, so those that are, this is a wonderful appetizer. 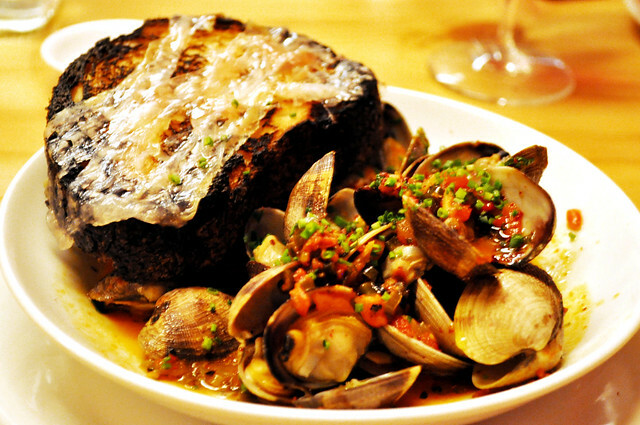 Last of the appetizers was the vongole -- manila clams with roasted red pepper, garlic scapes, pancetta, and beer as well as a slice of bread with melted lardo. Given the awesome ingredients in this dish (not only garlic and pancetta but beer as well!) , I was shocked to realize how it fell short of my expectations. Maybe it's the mussel-kick that I've been on lately, but to my dismay, the clams hadn't absorbed much of the flavor from the sauce that beautifully infused beer, red pepper, garlic, and pancetta into deliciousness as I would've liked. However, the lard-covered slice of bread allowed us to sweep up the juices left behind in the bowl quite efficiently and had the most savory of textures. 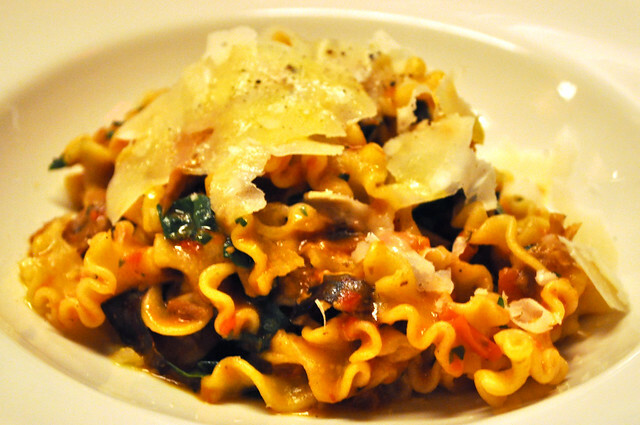 For our pasta course (the primi), we decided to share two different dishes, the first being the house-extruded lasagnette with spicy pork sugo, peppers, red onion, and Parmigiano cheese. Kind of a deconstructed, looser form of the usual lasagna, but better, as it wasn't totally drowned in sauce. It was the ideal balance of starch, cheese, meat, and tomato, and the slightly spicy flavors from the peppers and pork added another dimension to it as well. 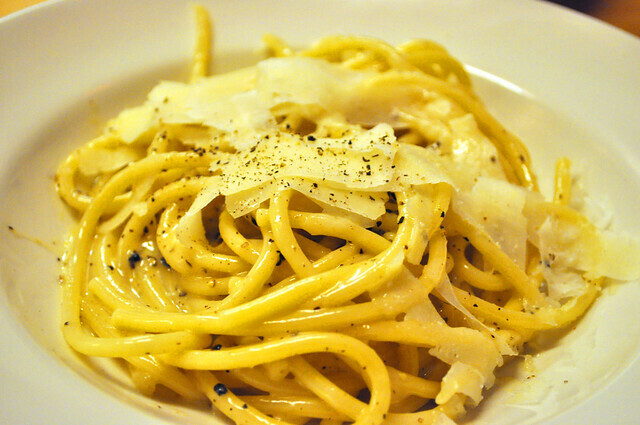 The second primi course was the bucatini cacio e pepe -- pecorino Romano, black pepper, and pasta by Gentile (an Italian brand sold at the Alimentari). Using only three simple staples to any solid pasta dish (noodles, pepper, and cheese), Chef Smillie crafted one creamy delight of shoestringin' starch. The melted squares of shaved pecorino Romano over the warm strands of golden Italian bucatini with the generous specks of black pepper made way for a very rich pasta without breaking the ingredient bank. The adage less is more undoubtedly rings true here. As our main course, our server suggested we share one of the secondi dishes, so it was rather a no-brainer to go with the spit-roasted short ribs with castelvetrano olives, celery, walnuts, and horseradish. It being spit-roasted was the least of the spectacle once it arrived on a wooden board, in all of its grand size. Jess even noted that given the size of this supposed "short" rib, it was almost as if it were out of the Flintstones cartoon -- you know the brontosaurus ribs from the Bedrock Drive-In that attempted to sit on the side of Fred's stone-wheeled car powered by his very feet against pavement. Well, maybe they weren't that big, but for the three of us, it was pretty sizable. To think, this was under the secondi courses -- dishes that I would normally assume could go a la carte as the main course for one person. Thankfully our waiter heeded us as we were ordering as to the recommended quantity of courses from each section so we wouldn't over/under-order. We shared this hunk of tender rib meat in happiness, as the exterior pieces were nicely charred from the spit-roasting and a little marbled from the natural fat within its dark flesh. Even as we are clearly in the seasonal bounty offered by the fleeting summer days, it was quite a hearty dish, especially with all of the accompanying earthy ingredients involved. This shouldn't go unordered, especially for a party of three or four like us. 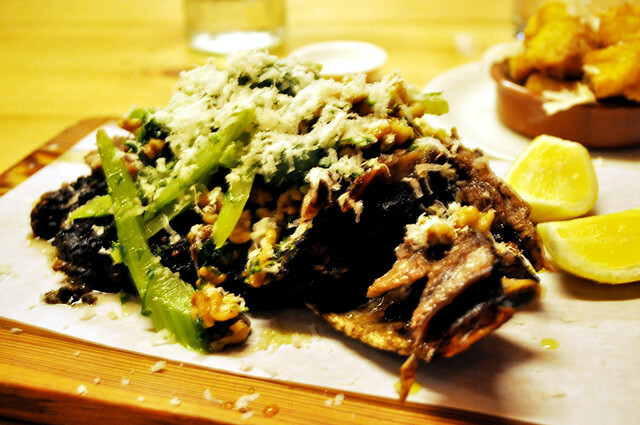 Alongside the spit-roasted short rib, we added a couple of side dishes (the contorni, i.e., dishes for sharing), including the crispy polenta. While the fried nature of the polenta was certainly a selling point (just like those fried Italian rice balls), I think I would have been just as happy (if not happier) if it had been the plain, ol' creamy kind. It would have made for a better textural contrast against the lightly burnt exterior of the short rib. The fried part of the polenta takes away from it a tad, as my palate lost its way for a bit before the short rib brought it back to its keen senses. We also had an order of the broccoli rabe. 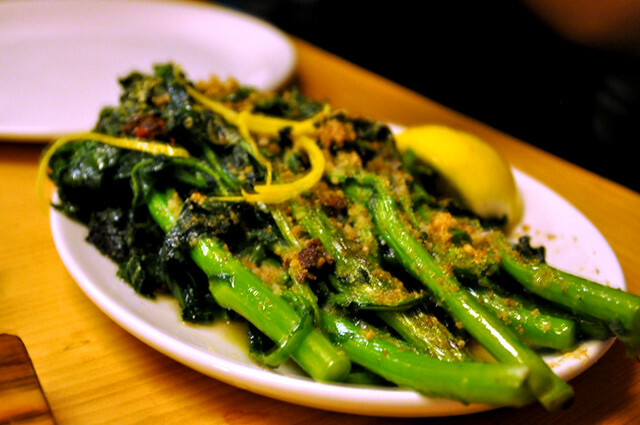 Simply sautéed, we had some solid broccoli rabe on our hands. Nice to have some green incorporated into our meal. Although we were really full from all the wonderful things we had eaten earlier, we still made room for dessert. The gelato/sorbetto offerings at Il Buco AV are quite a few for a restaurant like itself, mainly because the Alimentari part permits more flavors than the usual three or four typically seen on dessert menus. 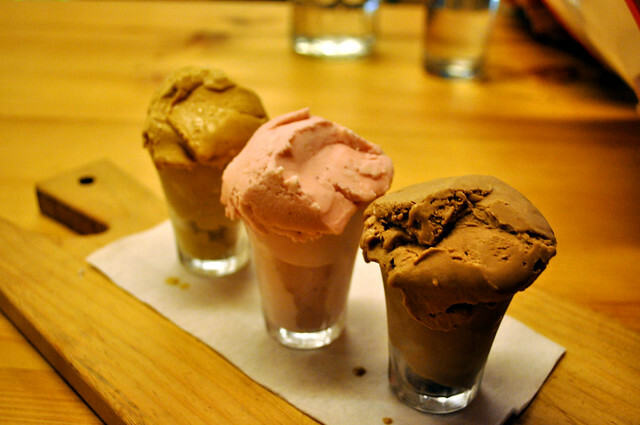 The standard sampler comes with three flavors, mix-and-matching gelatos and/or sorbettos, so we narrowed it down to salted caramel, strawberry, and chocolate chile. The salted caramel and strawberry were both pretty good (what you would normally expect), but the chocolate chile was the most interesting -- both bittersweet and subtly spicy, the flavor gave some vivacity to the gelato. Great combination! Only reservation was with the shot glasses in which the ice cream was served, which made it hard to share, scoop, and eat. Findings: When in great company of some wonderful girlfriends with a bottle of delicious wine, it's hard to have a bad time dining out. 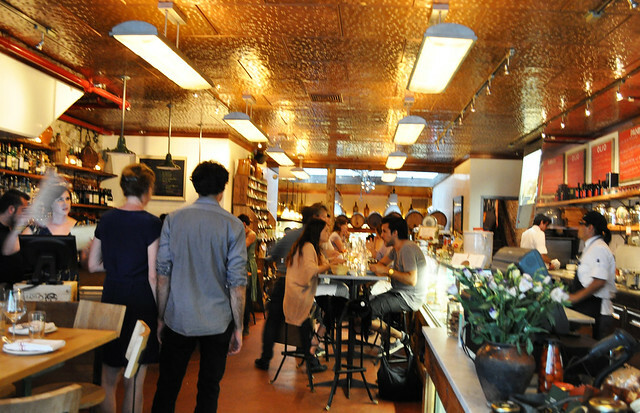 The same could be said of our experience at Il Buco Alimentari & Vineria, given its lively atmosphere of the Vineria and endearing resonating gourmet yet rustic undertones of the Alimentari. Most noteworthy is Chef Justin Smillie's super meticulous approach to curating the restaurant's menu with the highest quality ingredients that are readily available for that season. I really admire this dedicated commitment to this, because while most restaurants these days embrace the "farm-to-table" philosophy (as most certainly should), it's refreshing to see it when it's actually practiced pretty strictly and not just for bragging rights. Besides the quality ingredients, the other aspect of the dining experience that I was most incredibly impressed by was its salumi (cured meats, of course). It was melted perfection in our mouths, and as I've already professed, I am so willing to go back for just a platter of the salumi and a glass of wine. The story behind how the restaurant remains adamant and committed to the traditional Italian ways of curing pork is just so inspiring, and you can definitely tell that sticking by this authenticity makes a hell of a difference. If salumi isn't your fancy, then may I suggest the pastas (either house-extruded/made or by the reputable Italian brand, Pastificio Gentile) or the colossal spit-roasted short rib. You'll leave wondering why you hadn't come here sooner. 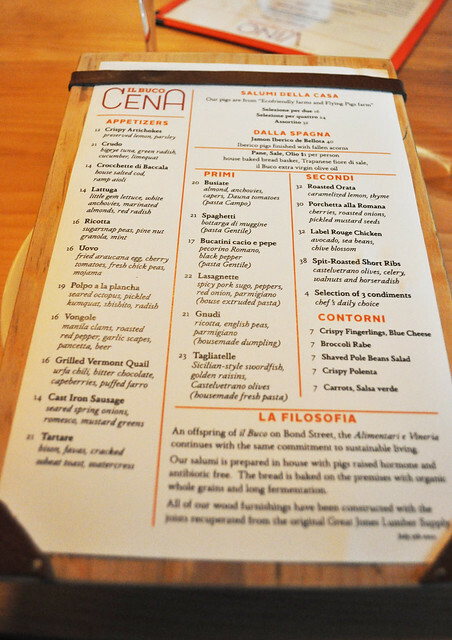 Price point: $12-16 for each appetizer, $16 for the salumi della casa per due, $17-22 for each primi, $38 for each secondi, $7 for each contorni, $9 for a tasting of three gelati flavors, $95 for a bottle of wine from Sicily. I forget how I got here yesterday–looking for an Um Segredo review?–but I came back today just to stare at that salumi plate some more. I agree with you entirely about the stringiness of some meats and can't wait to try this plate. Yes! It is definitely worth making the trip over there, even if it's just for that (and maybe some gelato)! :P Thanks again for stopping by -- very much appreciate new readers!